The Easter tulips were still opening their purple blossoms as we made our way to the sea to spend 5 nights camping at South Carlsbad State Beach Park while a heat wave was peaking in sunny San Diego. 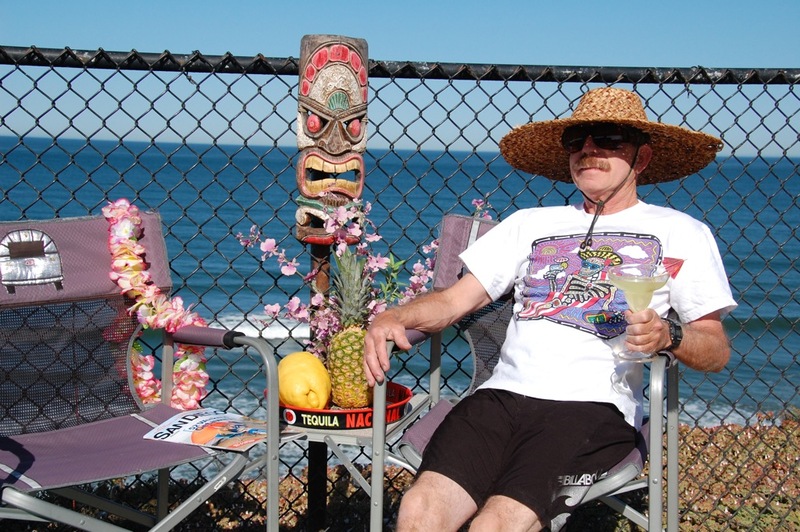 Cool sights, sounds of the surf, and delicious food and drinks made for a relaxing and enjoyable time. 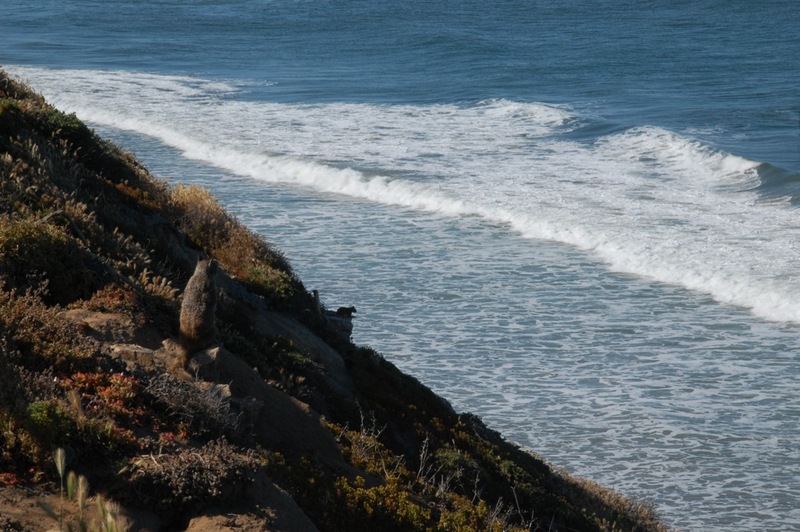 Our Safari trailer was parked on a bluff 50 feet above the beach within 15 feet of a sheer drop-off. 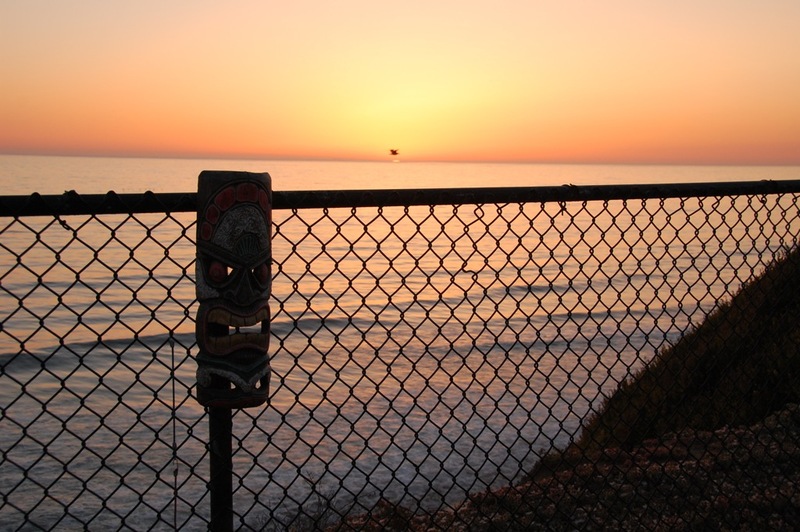 The nearby chain-link fence does not look pretty, but it is a safety feature that keeps tipsy people and dogs and other objects from tumbling over and reduces the incidence of costly beach rescues. Some people place chairs on the picnic tables when viewing the sunsets. The fence also plays a role as a makeshift tripod, keeping the Nikon camera steady while capturing squirrels gazing at the Pacific Ocean. 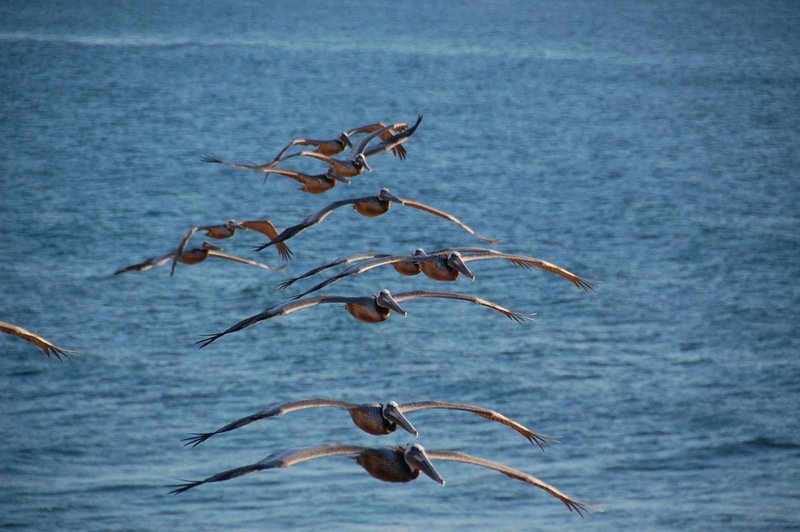 Long lines of pelicans, sometimes in a V formation, were seen gliding by our campsite throughout the day. 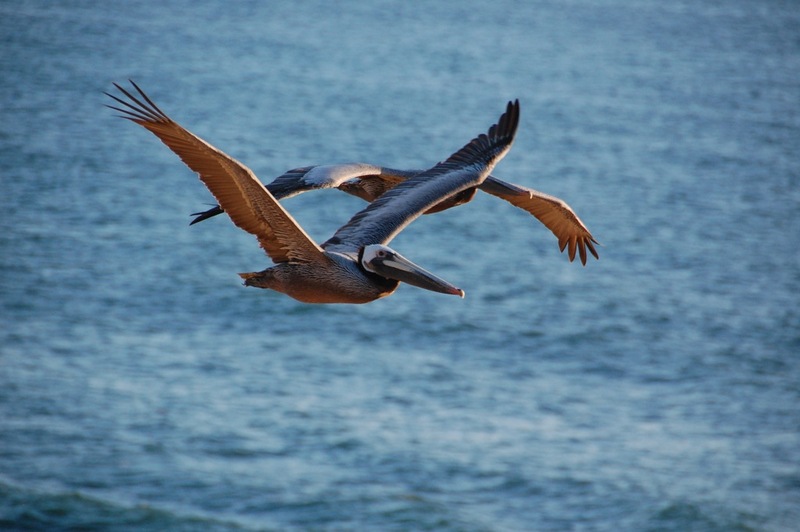 Once considered an endangered species by the federal government, the brown pelican population is now on the rise in California. 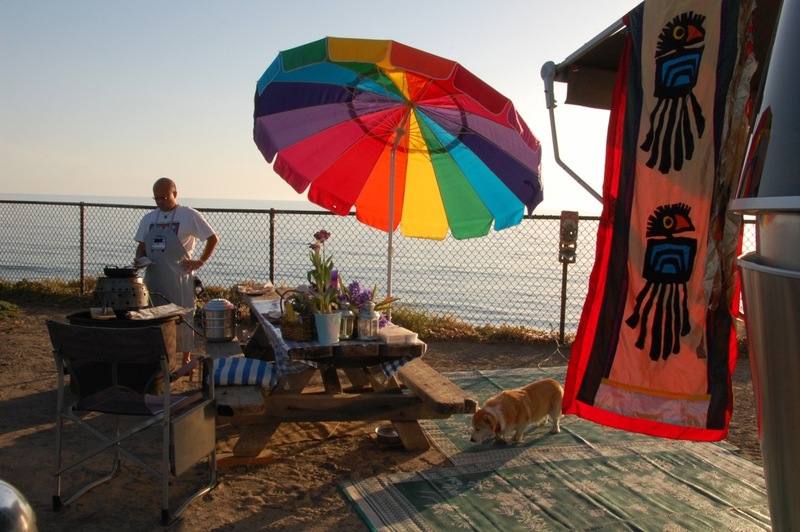 As the sunset approached with cooling late afternoon breezes, Larry was in his element as he prepared to deep-fry catfish nuggets, steam corn, and reheat sabzi polow (pilaf, a herb rice dish) that he made ahead of time at home. 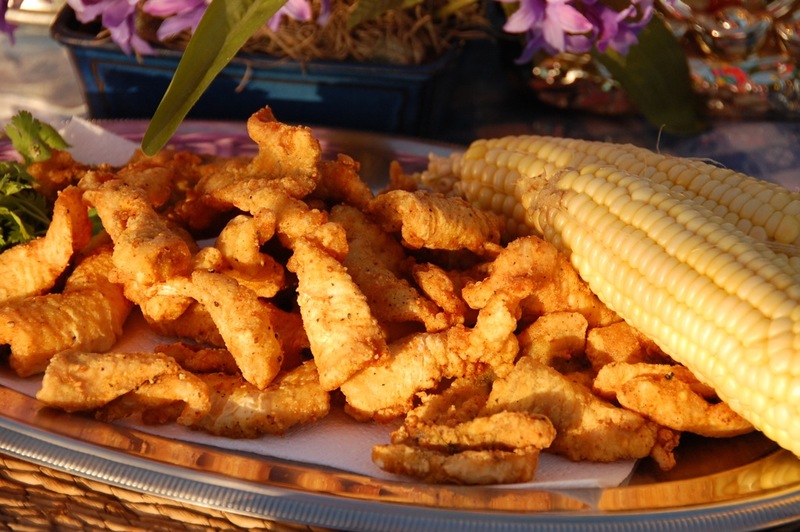 In making Mediterranean-style Deep-fried Catfish Nuggets, Larry used one cup of flour mixed with 1/2 tsp. turmeric (provides a beautiful golden crust), 1 tsp. crushed dried fenugreek leaf, salt and pepper, and coated the catfish nuggets while the pilaf and corn were steaming in the Chinese stacked steamer on the Volcano stove. When the pilaf and corn were done, Larry deep-fried the nuggets for 1-2 minutes (until golden), which were served with pilaf, corn on the cob, chilled champagne and a golden sunset. After dinner, we settled back in our folding chairs and gazed at the glowing, peaceful horizon. 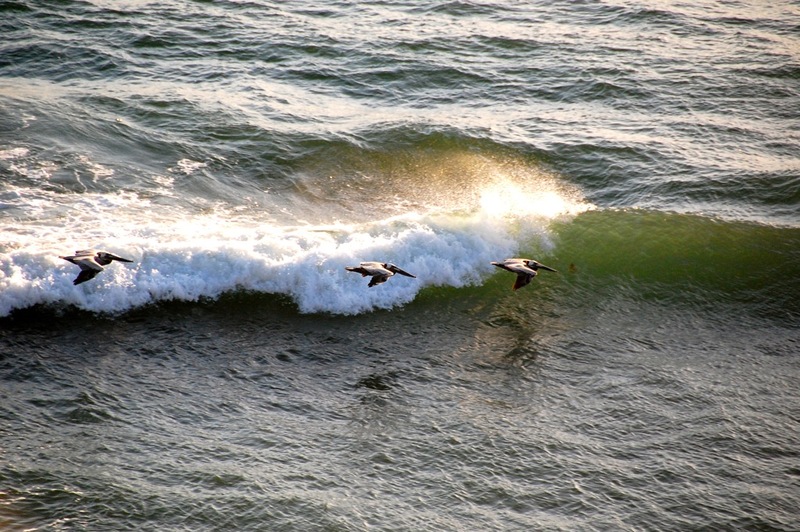 After the myriad sights, sounds, activities and strollers that flowed by our campsite each day, we welcomed the lulling and ever-constant rhythmic sound of the surf. Addendum: This article first appeared one week ago, but vanished in thin air while our blogging software (WordPress) was being updated. It took a few days to work out the bugs, but now it seems to be working, and it feels nice to spread my wings again and relearn how to fly… and feel the good vibrations!